One thing I always keep asking myself is how we as a staff can leave work each day knowing we made Elcona just a bit better than when we got into work that morning. Our eyes and sense of touch are still the most useful tool in answering that question, but increasingly technology is changing how we can become better stewards of the club’s resources. The USGA has integrated one such piece of technology into their 2017 USGA Golf Utilization Survey, and has asked Elcona to participate. We are one of 48 golf facilities nationwide participating. The careful management of resources (water, labor, energy, fertilizer, pesticides, etc.) 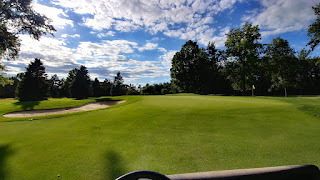 is an integral part of golf courses becoming more economically efficient and good care-takers of the environment while providing golfers with an enjoyable golf experience. To help golf courses achieve these goals, the USGA has developed a method to analyze how golfers use their course. This USGA Course Utilization Study provides decision makers at golf facilities with valuable insight into where available resources need to be focused the most. Members are asked to carry small GPS trackers in their pocket or clipped to their clothes during their round. You need to do nothing else except play the course as you normally would, and turn the device in to the Golf Shop staff after your round. After the round, the devices are collected and the data is downloaded. The result is a visual image that is imported into Google Earth. After the tracks of 200 golfers of varying abilities from Elcona are downloaded, the movement patterns will reveal a great deal about traffic patterns, feature use and potentially places on the course where pace of play issues arise. This data can be used to assess current and future maintenance needs as well. By agreeing to carry a GPS tracker, you are helping our staff better manage your course. You also are helping the USGA preserve the game now and in the future. The USGA will not collect the names of players who carry the GPS trackers. You are only asked for your name just in case you forget to return your tracker at the end of the round. The USGA does charge a $50 fee for each unreturned tracker, so it would be very important to return them so the club does not incur that cost. I thank you in advance if you are asked to help us with this survey, and I look forward to sharing the results with you when the USGA processes the data. As always, if you have any questions. Please contact me at ryan@elconacc.com, or stop me while you are out on the golf course. Have a great week!